The 20th Annual Screen Actors Guild Awards began with a bang as the red carpet was opened with its signature Taittinger champagne toast, led by American Hustle’s Elisabeth Röhm and Clovis Taittinger, the Export Manager for Champagne Taittinger. Next, both nominees and presenters took to the red carpet, walking its 15,872 square feet to pose for photographs and talk to the international media. Exciting those in the bleacher seats, actors like Bradley Cooper (American Hustle) and Oprah Winfrey (12 Years a Slave) stopped to say hello to fans and to sign autographs. SAG Awards Committee Chair JoBeth Williams and Committee Member Scott Bakula added to the red carpet elation by announcing the recipients of the Honors for Outstanding Action Performances by Film and Television Stunt Ensembles during the two-hour sagawards.tntdrama.com, tbs.com and People.com live red carpet pre-show webcast, which was also carried live for the third consecutive year on the giant CNN Spectracolor HD billboard in Times Square. For the third year in a row, the SAG Awards were the #1 Trending Topic on Twitter thanks to #sagawards Social Media Ambassador Sasha Alexander (from TNT’s Rizzoli and Isles), who tweeted all things SAG Awards including star sightings and what the actors were wearing. As guests entered the Shrine Exposition Center showroom, they were greeted by glittering chandeliers, a sparkling stage, and magnificent decor fit for the special anniversary. Wolfgang Puck Catering prepared delicious servings of grilled filet mignon with broccoli puree, miso glazed wild salmon, and alternative vegan plates of chickpea, fennel and winter citrus salad for the guests to enjoy during the show. All paired with Taittinger champagne, Chateau St. Jean Belle Terre Chardonnay and Beringer Knights Valley 2011 Cabernet Sauvignon, and FIJI Water. Prior to the telecast's start Terrence Howard introduced a filmed tribute to the philanthropic activities of the SAG Foundation, People magazine, and the Entertainment Industry Foundation (EIF). For the 18th year, PEOPLE magazine and EIF hosted the evening's post-awards gala and this year made a $1 million multi-year gift to the Screen Actors Guild Foundation in honor of the 20th anniversary of the SAG awards and to recognize actors' charitable work.  Not only was this year the 20th year of the Screen Actors Guild Awards, but it was also the 50th presentation of the Life Achievement Award. This year’s recipient Rita Moreno, truly fosters the “finest ideals of the acting profession.” Longtime friend and colleague Morgan Freeman presented the honor to Moreno, who both spoke and sang her emotional response to receiving the recognition. Honoring the actors who passed away in 2013, Tom Hanks (from Captain Phillips) took the stage to introduce the “In Memoriam” montage. Actor® recipient Ben Affleck (for Argo in 2013) announced the last award for outstanding performance of a cast in a theatrical motion picture. After the awards concluded, guests made their way over to the official Post-Awards Gala on the Shrine’s back lot. The Gala, hosted by PEOPLE Magazine and EIF, and produced and designed by Tony Schubert of Event Eleven, honored the SAG Foundation and actor’s philanthropic events. The inside of the tent where the Gala took place was richly adorned with 5,000 yards of pewter colored tapai silk with custom designed lattice panels made of acrylic and live moss. In the center of the room there were four large bronze moss-covered arches that reached 22 feet tall. While some guests lounged on plush sofas and ottomans, many took to the dance floor dancing the night away to sounds spun by DJ Michelle Pesce.